A 17th century door lock from a chateau. There is no key. Because we are side-by-side with the best French suppliers, we refresh our range weekly. This includes reputable experts and suppliers from Paris to Lyon, world renowned Isle-Sur-Le-Sorgue, Carpentras, and Avignon. A wonderful quality 19th century brass sliding bolt for a cabinet or cupboard although could well be used on a door. French or Dutch low countries, late 19th century. 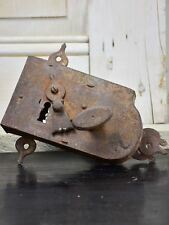 Victorian Door Lock. Architectural Antique. They are working but have a rusty used look and a nice antique feel. Antique IRON SKELETON KEY Lot of 9 Genuine 19TH C. FRENCH KEYS!, as seen in the pictures/as described in the title. May require a thorough detailing to bring to their full potential. Total weight of lot is 9.8 oz.